Some say, “Life is a series of collisions with the future; it is not the sum of what we have been, but what we yearn to be.” Without a doubt, the elderly English travelers arriving at the Marigold Hotel in Jaipur, India are open to living out the rest of their lives in search of finding purpose and harmony. What they didn’t expect was to have such a delightful time doing so. As viewers we too are brought along on this enchanting journey sharing in the mystery and discoveries of a new land. ‘Marigold’ succeeds on many levels, bringing us breathtaking landscapes, outstanding performances and captivating discoveries. By far, one of the best films this year. Tom Wilkinson, Bill Nighy, Penelope Wilton, Celia Imrie and Ronald Pickup. Each having an agenda; some secretive and some downright in your face, all looking for validation and peace in a foreign land. Deliberately slow in pace, the film meanders while we soak up the vibrant colors and sounds of the heavily populated region. Yes, we are fully immersed! Director John Madden, (“Shakespeare in Love”) purposely lingers on wide-angle shots allowing the mind to contemplate. At times, the cinematography is so mesmerizing you can almost smell the fragrant flowers and taste fresh, colorful fruits at the markets. Madden’s characters are very well developed. We care for them, in this poignant film centering on growing old, life lessons and adapting to changes. Oliver Parker pens the screenplay based on the novel “These Foolish Things” by Deborah Moggach. Yes, I definitely can say that you should check in to the Marigold Hotel as you’ll be filled with lingering memories that will stay with you long after the credits roll. 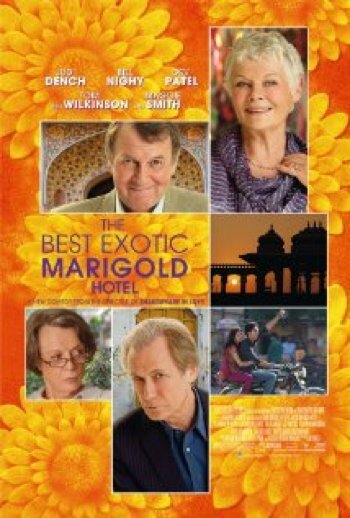 The story begins with the characters learning about the Marigold Hotel through the enticement of a sleek web advertisement, billed as a retirement option with pristine accommodations. Much to everyone’s surprise, when they finally arrive, they find a run down place that is in the middle of restoration. They are met by an exuberant, starry eyed young manager, Dev Patal from the Academy Award winning film, “Slumdog Millionaire,” who tells them with a beaming smile, “Don’t worry everything will work out,”after he shakes the dust off of the covered furniture. Both Dench and Smith play single women who are looking for validation. Tom Wilkinson, also single, is a respected judge who’s looking for a long last friend. Bill Nighy and Penelope Wilton, play a married couple who are always disagreeing. Celia Imrie and Ronald Pickup are both single, hopeless romantics and looking for love. After the guests have adapted to their somewhat substandard dwellings, they each venture off and find their way in the hustling and bustling city of Jaipur. Dench manages to find a job in an outsourcing tech call center, which sheds further light into the culture. All in all, each find their way and we are along for the ride. Bottom-line: Here’s a gem of a film that is slowly paced and a treat for the senses. Top-notch acting and directing!